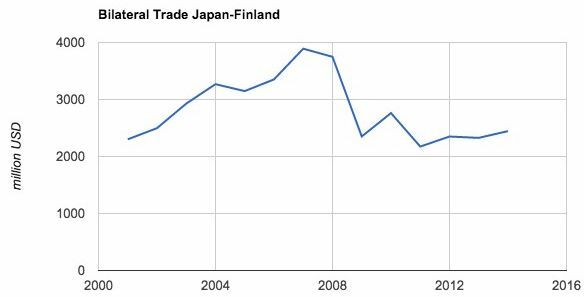 HIGH NORTH NEWS: Economic development across the Barents region is a top priority for the President of Finland and the Prime Minister of Japan. During a three-day visit to Japan, the two leaders discussed the shared cooperation of shipping along the Northern Sea Route. Following a summit meeting between Finnish president Sauli Niinisto and Japan’s prime minister Shinzo Abe, the two countries announced the further strengthening of their cooperative relationship across the Arctic region. The two leaders stressed the geopolitical importance of the region to each nation, in part derived from their location near the eastern and western termini of the Northern Sea Route. As part of the three-day visit to Japan that took place March 8-11, Niinisto and Abe discussed their shared vision for a strategic partnership in the Arctic, which included a reaffirmation of the importance of environmental protection, sustainable use of natural resources including energy, minerals, forestry and fisheries, as well as the protection of the rights of indigenous peoples across the region. Additionally, the two leaders stressed the importance of economic development across the Barents region, drawing on political will and academic resources to further develop commercial opportunities. The two countries’ ongoing cooperation in the Arctic has included a number of “Arctic fact-finding missions” conducted in June 2014, and March and May 2015, primarily focused on the energy and shipping sectors. Furthermore, Japan’s National Institute of Polar Research (NIPR) and the Finnish Meteorological Institute (FMI) recently began collaborating on a wide range of research areas, including the impact of climate change on Arctic snow coverage and the utilization of satellite simulations to enhance safety in Arctic shipping. Japan’s large northern ports on the island of Hokkaido represent a potential hub for traffic coming from or going to the Bering Strait. Japan, in particular, has been an early benefactor of shipping along the NSR, receiving shipments of liquefied natural gas (LNG) produced at Norway’s facility at Hammerfest in 2012 and 2013 as well as two shipments of Naphtha in 2013 to the ports of Chiba, Futtsu, Mizushima and Tobata. Additionally, the Japanese port of Osaka received a delivery of seafood from Norway via the NSR in 2015. The importance of Arctic shipping was also underscored at a recent press conference where Japan’s ambassador for Arctic affairs announced closer cooperation between Japan and Russia to increase navigation along the route and to research the Yamal LNG project. Rule of Law Key to Shipping With respect to shipping, Japan and Finland stressed the importance of the adherence to the Law of the Sea and the peaceful settlement of any maritime disputes in accordance with international agreements, such as the United Nations Convention on the Law of the Sea (UNCLOS). The freedom of navigation of the seas and secure access to international markets has long been a key priority to both nations. Earlier in 2016, in a speech titled The Bounty of the Open Seas: Five Principles for Japanese Diplomacy, Abe highlighted the country’s heavy reliance on shipping to import and export most of its goods, and stated that, as an island nation, the “safety of the seas” and “its own safety” are inseparable. Following the shutdown of a large percentage of its nuclear plants in the aftermath of the 2011 earthquake, Japan’s need for hydrocarbon-based energy imports increased significantly, some of which were fulfilled via the NSR. Bilateral trade stagnant since 2008 Trade between the two countries experienced steady growth between 2001 and 2008 but has been largely stagnant since the economic downturn of 2009. 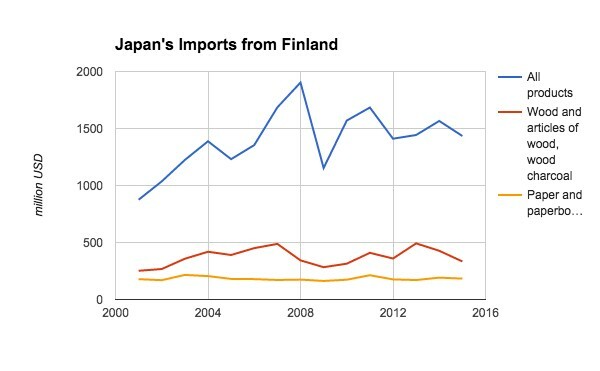 Japanese imports from Finland grew from $870 million in 2001 to nearly $2 billion in 2008. In 2015, imports totalled $1.45 billion with wood and paper products accounting for around 35 percent of trade. Similarly, the overall trade volume, peaked at nearly $4 billion in 2007 but has since hovered around $2.5 billion. In light of these stagnant trade figures, it remains to be seen if closer cooperation in the Arctic and the development of shipping routes can provide a needed stimulus and reinvigorate trade between the two countries. This story was originally published in High North News and is reproduced here with permission. Malte Humpert is the strategic director and founder of the Arctic Institute.